Modern Android NDK (10+) comes with recent versions of gdb/gdbserver (7.x) that have handle shared library events correctly. If you are using an older toolchain (gdb 6.x), or are experiencing strange problems with threads or libraries, please switch to a newer gdb/gdbserver. Warning: the information below is related to older versions of Android NDK and VisualGDB and is not relevant with VisualGDB 4.x+ and Android NDK 10+. 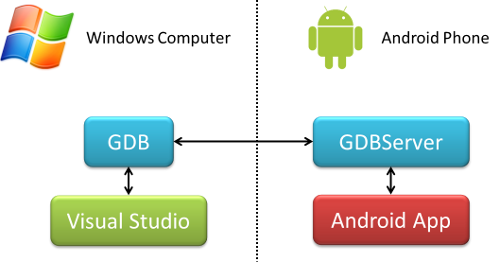 The newer GDB 7.4.1 requires Android 2.2 or later (e.g. 2.3.3, 3.x or 4.x). The newer gdbserver 7.4.1 supports NEON, but does not work with old gdb 6.6 (and thus needs Android 2.2 or later). Additionally, it sometimes fails to attach to the app with the Operation not permitted error. It is recommended to use gdb 7.4.1 and gdbserver 7.4.1. If you do not need the NEON register debugging and encounter the Operation not permitted error when trying to start debugging, downgrade to the old gdbserver. If you need to debug older Android versions (1.x or 2.1), use the old gdb and gdbserver. To switch between several gdb/gdbserver combinations, open VisualGDB Project Properties and change the value of the "GDB/GDBSERVER Versions" combo box.